Raise your Teacup for Catherine of Braganza! 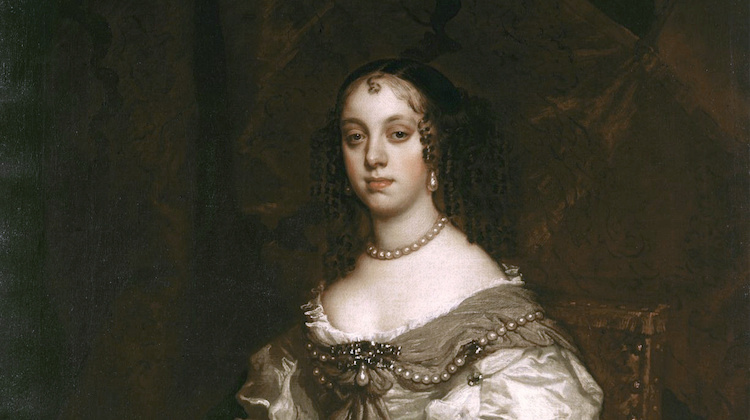 For National Tea Day, Isabel Stilwell investigates the story of Catherine of Braganza, the queen who popularised Britain’s favourite drink. And she would, I am sure, squirm if she saw us all drop a teabag into a mug, or worse, a paper cup, without any ritual or preparation. At best she would have argued that we “lacked tea”, or hadn’t drunk it as children, which in Portugal are two ways of telling that someone is uncouth. Of course, we know Catherine of Braganza wasn’t the first to introduce tea in Britain — Samuel Pepys talked about it two years earlier — but she did turn drinking it into a fad at court, a social habit between her ladies, dazzled by the beauty of the porcelain teapots, saucers and cups she brought with her. And as the price of this exotic drink lowered, it took over the rest of the kingdom. But Catherine did more for tea than tug along a trunk of tea leaves in her luggage: she brought with her an infinite source of tea as part of her dowry, as well as a secret treaty that ensured the help of the English in safeguarding Portugal’s independence from Spain, and regaining Portuguese territories from the Dutch. Catherine was born the daughter of a duke, in a family palace in Villa Viçosa, in the south of Portugal. 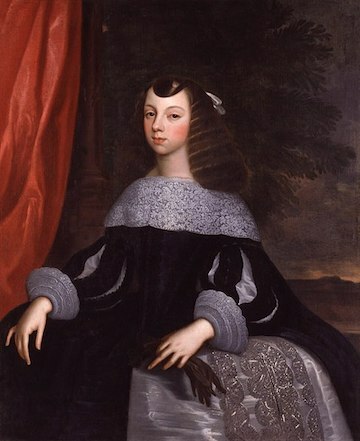 She soon became a royal princess, when her father was acclaimed king, as Portugal’s independence from Spain was restored. The death of her two eldest siblings made her the most important pawn in the diplomatic challenge of consolidating the new Braganza dynasty. In other words she had to be quickly married into a European royal family. Her father, king João IV, sent in haste for the best “photographer” he could find – a pre-requisite for advertising her hand. Dirk Stoop’s painting of Catherine is the first portrait we have of the princess, not much more than ten years old at the time. In it we find a dark haired girl, her face made brighter by big dark eyes, elegant features and rosy cheeks – sweet looking. In the meantime, Charles II was looking for a wife. Like Catherine’s father he was a newcomer to the throne, with empty coffers, but even his need for money couldn’t trump his aesthetic standards. Sure, she didn’t have to be as beautiful as his mistresses, namely Barbara Palmer, the favourite at the time, but he refused to have an ugly woman in his bed. So much so, that he didn’t trust the portrait, sending a reliable spy to Lisbon to confirm that the lady in question was not only good looking, but that she also had none of the flaws the Spanish ambassador swore she possessed. That worry at rest, he agreed to talk about money. He particularly wished for a lucrative settlement, as part of it would go into his own pocket, hidden from the stingy vigilance of Parliament. Catherine’s strong and wilful mother, regent at the time, knew she had to bid high, and promised £500. Plus, in a secret clause, she offered Tangier, with its immense possibilities of commerce in the Mediterranean; Bombay, with its riches and strategically located ports; plus free trade in Brazil, India and Africa. Later, Charles leased Bombay to the British East India Company, at £10 a year, paid in gold, ensuring the monopoly of English trade, and that Catherine’s tea would be forever in English teapots. 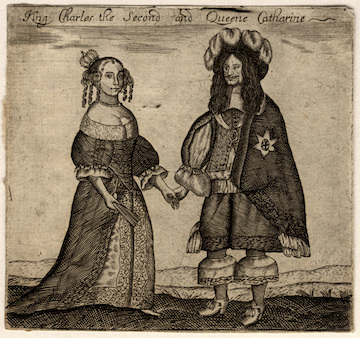 Finally in December of 1661, the marriage was agreed. Charles was quick to write to his new wife, telling her in a very passionate letter, that he longed to see her beloved self in the kingdom that is already hers, with the same longing he felt during his long exile from England. He then showered her with gifts, sent to Lisbon with such pomp and circumstance as to really impress the 23-year-old girl, who for years now had been listening to tales about his dashing adventures. She answered back, and in the exchange of letters we discover Catherine’s strong character and determination. She learnt English, she applied herself to standing in high heels, because they told her the King prefered tall women, and she would dispense with most of her clothes on arrival in Plymouth, realising they were out of fashion in the English court, but she would never give up her faith or her love for her husband. And Charles, although never faithful, was loyal, even when after several miscarriages she was unable to give him an heir, and Parliament insisted he should set her aside. Thankfully we have the letters, letters between Charles and Catherine, between Catherine and her mother, between ambassadors, and reports and diaries. I love diaries, and paintings and portraits that make it possible to come closer to the real Catherine, so often described as dull, a dimwit or a bigot. For example, Catherine didn’t grow up in a forgotten land, behind the walls of a convent, as so many will still tell you, but in the Ribeira Palace, overlooking the Tagus’ riverfront, surrounded by ambassadors and musicians, philosophers and scientists, and all those who landed in Lisbon, then an obligatory trading point. Isabel Stilwell is a Portuguese journalist and writer. Her historical novel on Queen Filipa de Lencastre, published in 2007, was a huge success, selling more than more than 55 thousand copies. 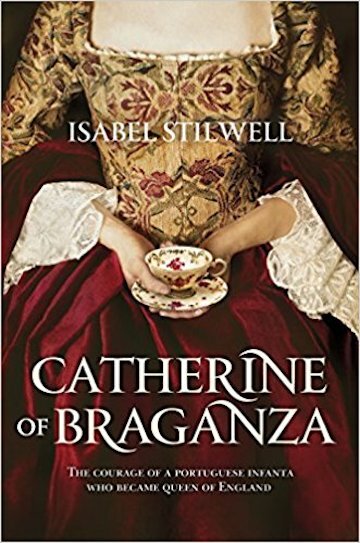 Since then Isabel has written six historical novels about the queens of Portugal, including Catherine of Braganza. Philippa of Lancaster was her first book translated into English, followed by Catherine of Braganza, which is available from Livros Horizonte via Amazon. All Images: All Rights Reserved: Catherine of Braganza, The Courage of a Portuguese Infanta Who Became Queen of England.